Birth control pills are the most common form of contraception, but just because our doctor prescribes it to us doesn’t mean we know as much about it as we should. There are so many myths surrounding the Pill, its uses, and its potential side effects, and it can be hard to tell what’s fact and what’s fiction. Don’t stress—we’re here to clear it up once and for all. Myth: The Pill will make you gain weight. Reality: The Pill works by using estrogen and progestin to play with hormone levels, and yes, hormonal fluxes can cause weight gain. Generally, this perceived “weight gain” is due to water retention, similar to the bloat you feel before and during your period. Furthermore, modern birth control pills contain much lower amounts of hormones than those that were available in the ’60s, which is probably when this rumor started. For the most part, this myth is just that—a myth. Reality: The Pill most definitely does not cause blood clots. Most birth control pills do, however, make you three or four times more likely to develop a blood clot than someone who isn’t on the Pill. Estrogen increases the levels of factors that lead to clotting, but even so, only one in 3,000 women per year who take the pill will actually develop a blood clot. There are several other health factors that contribute to the likelihood of developing a blood clot, including smoking, age, weight, a sedentary lifestyle, and family history. Myth: The Pill will give you clear skin. Reality: A group of hormones called androgens are responsible for sebum production, an excess of which leads to acne. Birth control pills reduce the amount of androgen in the body, which results in less sebum. If you’ve ever broken out around your period (and who hasn’t? ), you’ll know that it’s the fluctuation of hormone levels in your body that causes those monthly flare-ups. While it’s been known for decades that using the Pill to both regulate hormones and prevent pregnancy has the happy side effect of reducing hormonal acne, only three (relatively new) pills have actually been approved as acne treatments. Myth: You have to take the Pill at the same time every day. Reality: If you usually take your pill first thing in the morning, and now it’s noon and you just remembered, don’t freak. Unless you’re on a progestin-only pill, it doesn’t matter what time you take it, just that you take it every day. The vast majority of pills combine progestin with estrogen—if you were on a progestin-only pill, you’d know it. Taking the Pill at the same time every day can, however, statistically make it “more effective,” but that’s only because you’re more likely to take it every day if you set a regular alarm or another type of reminder. Myth: You can use the Pill to skip your period. Reality: It’s true—if you skip the seven days of inactive pills at the end of your pack and start a new pack right away, you won’t experience that week of “withdrawal bleeding.” There are also some newer pills that are made to be used continuously so that you only get your period a few times a year, if at all. One of the biggest benefits of the Pill, especially if you suffer from bad cramps or PMS, is that it makes your periods shorter, lighter and generally less painful. Myth: Using the Pill to skip your period is bad for your body. Reality: Now here’s a fun fact: The “period” you get when you’re on the Pill isn’t actually a period. The Pill “mimics” a natural menstrual cycle, but the bleeding you get during that final week is not the same as a regular period. The hormones in the Pill trick your body into thinking it’s pregnant, which suppresses the menstrual cycle, so while you’re on the Pill you’re not really menstruating at all. There’s no reason why that monthly scheduled bleeding has to happen for your health. Myth: Taken daily and as prescribed, the Pill is 100% effective. Reality: No form of birth control is 100% effective, but taken correctly, the Pill is up to 99.9% effective. Of 100 women who take the Pill each year, about 5 are likely to get pregnant, and the risk is far lower for women who take the Pill “perfectly.” There are a number of other factors that can render the Pill less effective—certain antibiotics and supplements, including St. John’s Wort, can affect the Pill’s effectiveness, and it’s also less effective in women who are very overweight. 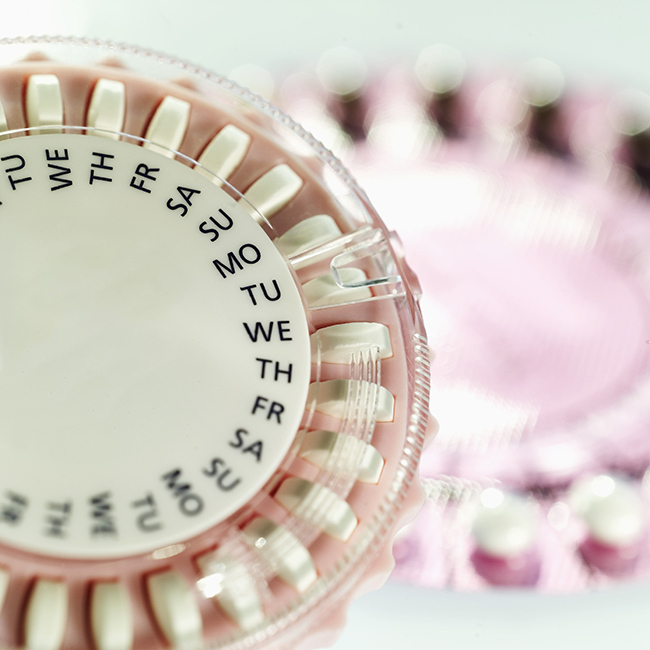 Myth: Long-term use of the Pill will make it harder to get pregnant when you go off it. Reality: Not at all! Pregnancy is possible as soon as you go off the Pill, and there is no evidence to suggest that long-term use of the Pill affects fertility in any way. It takes only a couple of days for the Pill’s hormones to leave your body, and your body should return fully to its natural menstrual cycle within a couple of months.